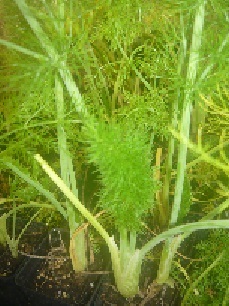 Trevi Fennel (foeniculum vulgare) - Wonderful anise licorice flavored leaves are used to flavor fishes, soups, stews, etc. Bulbs are also used in cooking. Feathery green foliage. Likes full sun. Important butterfly host plant. Annual. Live plant in 3 inch container.